Have you noticed this funny trend with sites dropping the “e” in their name and just going straight to the “r” or adding two? I see it all the time! But what are you supposed to do with the grid when you are done? Does it save the html or css or anything? Your timing couldn’t have been better – I was looking for grid references yesterday. You must be psychic. I happen to dislike this tread a lot, which I have noticed as well! It started with Flickr and has spread all over the place. It worked for Flickr, but now at least to me it makes these sites look like they are trying *way too hard* to be “web 2.0” and “hip”. Though, as an aside, it could also be partially the result of most good single or double word domain names being taken already, forcing people to come up with short, unique names. nice, but hey tina i noticed ur on ffffound can you invite me so i can get an account? I agree, but I’d give the author of the site the befit of the doubt and assume he did this tongue in cheek. 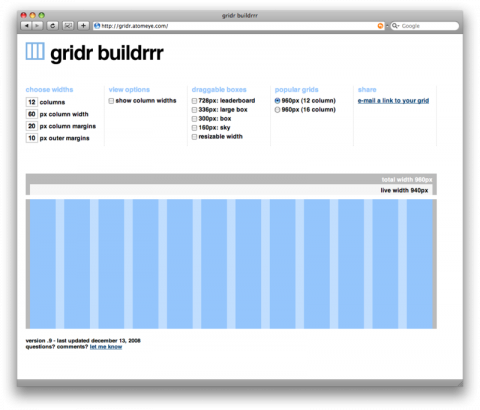 Nice, but what exactly are these grid layouts meant to be used for? There doesn’t seem to be any way to export or use them for anything..! ?